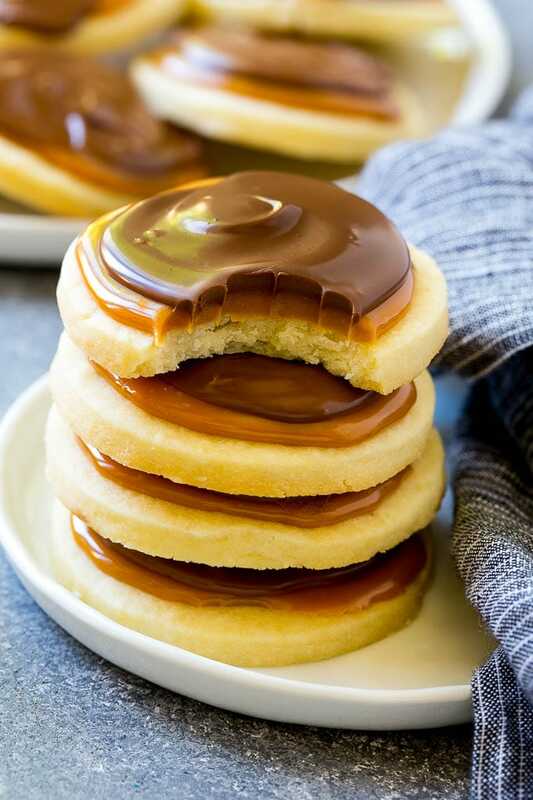 These Twix cookies are rounds of shortbread topped with caramel and milk chocolate. An easy and impressive cookie that tastes even better than the popular candy bar! I can never resist a Twix bar, and these cookies have that same gooey chocolate and caramel combination. They’re easy to make and a total crowd pleaser! I make these cookies during the holidays along with crockpot candy and reindeer chow. Do you ever make a recipe and end up getting impatient before it’s finished because you just can’t wait to eat it? That’s how these Twix cookies were for me. The kids and husband ended up loving them just as much as me. A chocolaty caramel cookie that you’ll want to make again and again. HOW DO YOU MAKE TWIX COOKIES? Once you’ve mixed and chilled your cookie dough, cut out the cookies using a 2-3 inch cookie cutter. Space the cookies on a cookie sheet lined with parchment paper about 1/2 an inch apart. Once baked, spoon the rich and creamy caramel onto the top of each cookie and let it firm up before adding the chocolate on top of the caramel. Let the chocolate cool and eat as many as you like! If needed, the cookie dough for these chocolate caramel cookies can be made in advance. It will keep in the fridge for 3 days or up 3 months in the freezer. When making the cookies, I use a 3-inch cookie cutter. 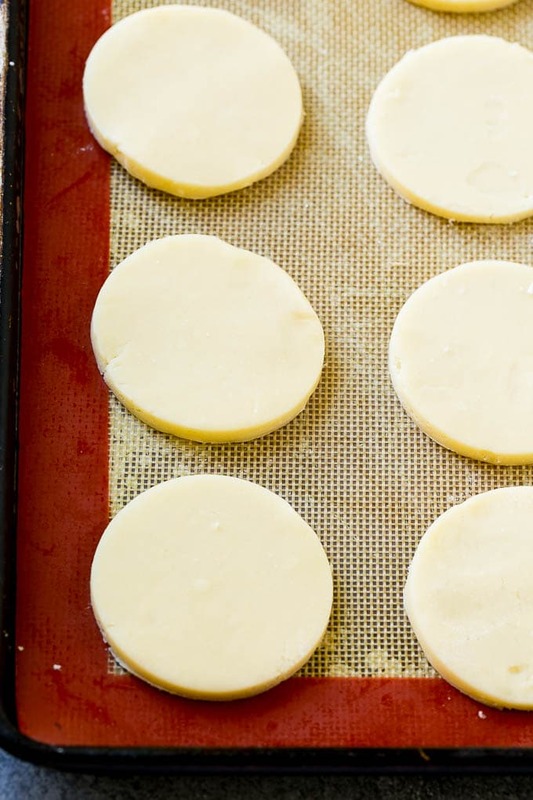 You can use a smaller or larger cookie cutter, just be aware that the bake time will change. I prefer using the unwrapped caramel bits that you find in the baking aisle for the caramel layer on these cookies. However, normal caramels work great as well. Once everyone is finished devouring the cookies, they will keep in an airtight container for around 5 days. HOW DO YOU MAKE HOMEMADE CARAMEL? There are a few ways to make caramel at home. I prefer using the already made caramel bits and adding milk to them. 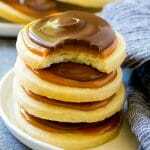 However, you can also make caramel by boiling sweetened condensed milk for around 3 hours. The longer version of making caramel involves simmering brown sugar, corn syrup and evaporated milk until it gets thicker and forms caramel. WHY DOES THE COOKIE DOUGH HAVE TO BE CHILLED? Some people skip the chilling part. However, the dough is a lot harder to work with and usually ends up resulting in cookies that spread and are not uniformly shaped. I like having a prettier cookie because I often give these Twix cookies as gifts during the holidays. 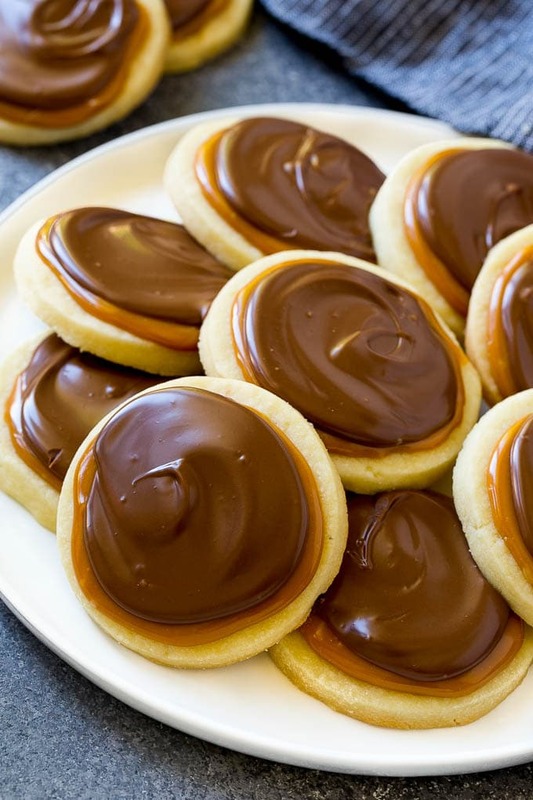 These Twix cookies take a bit of effort but are seriously worth it. They’re such a rich treat that goes over well for all ages. I think these cookies taste even better than the original candy bar and I’d bet that you’ll agree! Preheat the oven to 350 degrees F. Line a sheet pan with parchment paper or a nonstick baking mat. Place the butter in the bowl of a mixer and beat until light and fluffy. Add the powdered sugar and beat until combined. Add the vanilla extract, flour and salt to the bowl. Mix until combined. Place the dough on a sheet of plastic wrap. Fold the plastic wrap around the dough and chill in the freezer for 20 minutes. Flour your work surface and roll out the dough into a 1/2 inch sheet. Use a 2 or 3 inch round cookie cutter to cut out cookies. Place the cookies 1 inch apart on the prepared baking sheet. Bake the cookies for 12-13 minutes or until edges are light brown. Repeat the process with the remaining dough. Place the caramels and evaporated milk in a bowl. Microwave at 45 second increments until caramel is melted. Stir until smooth. 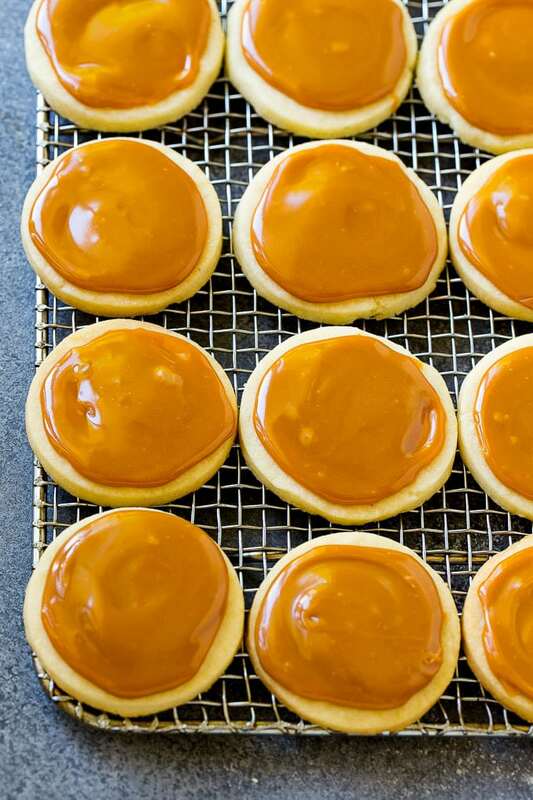 Place a spoonful of caramel onto each cookie, using the back of the spoon to spread it to the edges of the cookie. Let the cookies sit until caramel has firmed up, about 20 minutes. Place the milk chocolate chips and shortening into a bowl. Microwave in 30 second increments until chocolate is melted. Stir until smooth. 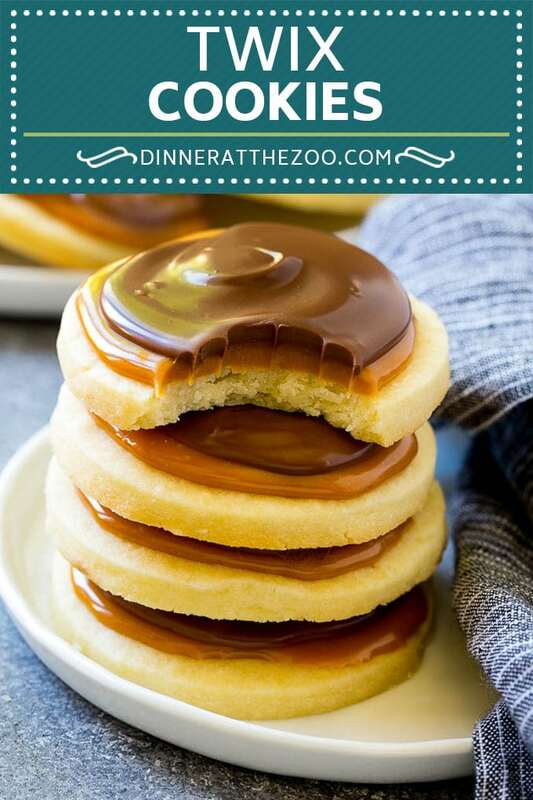 Place a spoonful of melted chocolate onto each cookie and spread it over the caramel layer. Let the cookies sit until the chocolate has hardened, then serve or store in an airtight container for up to 5 days. board on Pinterest. I am wondering two things. for this once it is thickened? the milk chocolate bar. Please let me know. You can use butter for the chocolate! In terms of the caramel, you just need to make sure that it’s really thick and spreadable. Hope this helps! Maybe I missed seeing it above, but how many dozens does a batch make? It makes about 30 cookies! You can use butter or coconut oil instead! Yum this recipe looks amazing. 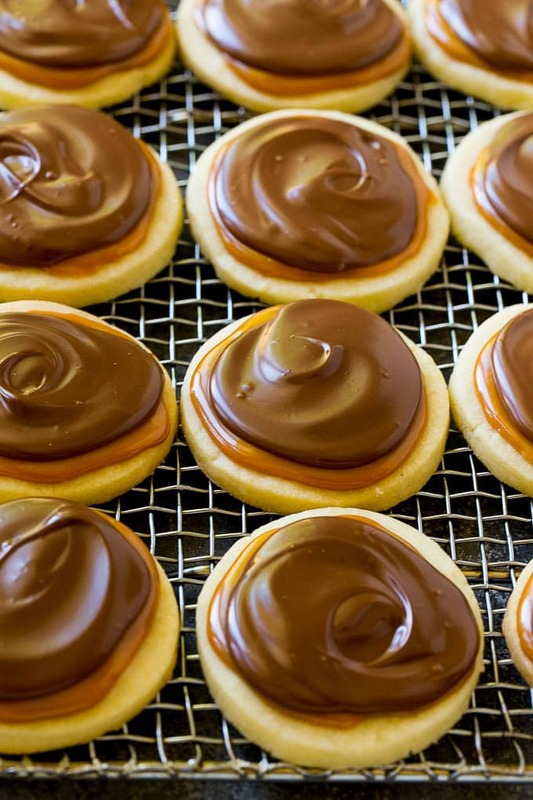 We love to bake from scratch and we love Twix! I haven’t had a Twix in such a long time. These cookies look and sound absolutely delicious can’t wait to try this recipe. Gorgeous shots! These cookies look amazing! I love twix bars so I definitely want to make these…they won’t last a NY minute in my house! These do look like a cookie for a special occasion! Many steps but I bet the are divine! Ooh a Twix is usually my chocolate bar of choice so these cookies sound like perfection to me. They have my mouth watering, I’d be tempted to eat them all at once! I used to eat Twix bars like crazy. I bbet these taste wonderful! Five stars for sure! OMG – these look unbelievable – next cookies I bake for sure! These looks yummy and very delicious. Look at this layer by layer sweetness overload. It’s now making me crave for this staff. This is the best cookie idea I’ve seen in a while! I love the flavors there. 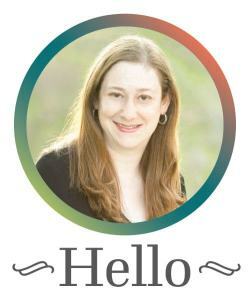 I’m addicted to TXIX, and I love a good cookie, sooooo…. Can these cookies be put in the freezer once all finished with the melted Carmel and chocolate on them ? Yes they can! Just thaw at room temperature!